Photo: Israel Crane House, ca. 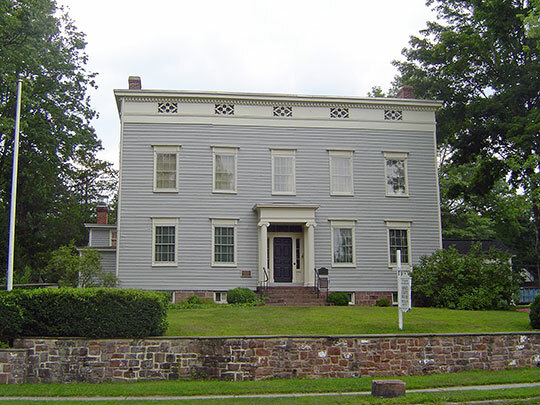 1796, 110 Orange Road, Montclair, NJ. The historic district was listed on the National Register in 1973. Photographed by User:Tlantanu (own work), 2008, [cc-by-1.0 (creativecommons.org/publicdomain/zero/1.0/deed.en)], via Wikimedia Commons, accessed November, 2013. Essex County administrative offices are located at 465 Dr. Martin Luther King Jr. Boulevard, Newark NJ 07102; phone: 973-853-3390. Essex County was first formed in 1675, and its boundaries were definitely fixed by the act of Jan. 21st, 1709-10, comprising the territory then known as Elizabethtown and Newark. Its original limits have since been reduced. It is now about 20 miles long, with an average breadth of 12 miles, being bounded north by Passaic and a small part of Morris counties; E. by Hudson co., Newark Bay, and Staten Island; south by Middlesex County; and west by Somerset and Morris counties. The face of the county is generally level; the soil well cultivated, and highly productive. Two trap ridges, known as the first and second mountains, (the latter sometimes called the Short Hills,) enter the county on the SW and cross the western part in a NE direction, and pass into Passaic County. The Passaic and Rahway rivers are the principal streams. In 1840 there were produced in the county 34,692 bushels of wheat; rye, 34,244; Indian corn, 225,314; buckwheat, 39,588; oats, 181,261; potatoes, 178,193 bushels. There were 203 stores, with a capital of 8,524,650. Capital in the fisheries, $60,000; 6 fulling, 20 grist, 21 flouring, and 25 saw-mills; 18 paper factories, 3 woolen, and 2 cotton factories; 4 dyeing and printing establishments; 10 tanneries, and 6 potteries. Capital invested in manufactures, $3,170,568; 16 academies, with 680 students. The county is divided into the 13 following townships: Belleville, Elizabeth, New Providence, Springfield, Bloomfield, Livingston, Orange, Union, Caldwell, Newark, Rahway, Westfield, Clinton. The population of the townships [composing Essex County as of 1846], was in 1810, 23,961; in 1820, 27,455; in 1830, 34,201; in 1840, 44,621.